HSE recommend that anyone who uses a lift truck should have a recognised certificate of training and competency. 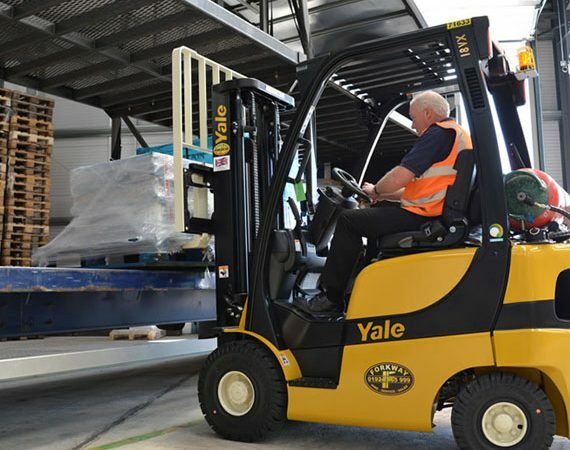 Anyone who is required to use any type of lift truck in agricultural and other industries, from experienced drivers who just require refresher training to novice drivers who will require more comprehensive training. Identification of the basic construction and components and the purpose and use of all controls and gauges. Identification and compliance with manufacturers instructions in accordance with the operator’s handbook and other information sources. How to carry out all pre-use and running checks. How to configure the vehicle for site (and road) travel. Manoeuvering in confined areas using forward and reverse direction, both with and without a load. Safe travel over different types of terrain, both with and without a load. Effective lifting and placing of various loads. How to ensure load integrity and security. Placing and retrieving loads accurately at various places from a vehicle bed or trailer, keeping within safe working parameters. How to place the machine in an out of service condition. Ability to explain the loading and unloading procedure on and off a transporter.